When you walk into a room, what’s the first thing you notice? The venue? The people? The atmosphere? You breathe it all in, and most times if you’re anything like me, you relate more to a warm and comforting feeling you get from the environment. And that’s exactly what this night was. This past weekend, I produced and organized The Raining Season’s 2nd Annual Gala. It was the perfect setting to support an amazing cause. The look was a natural, Earthy, yet a perfectly elegant mix. 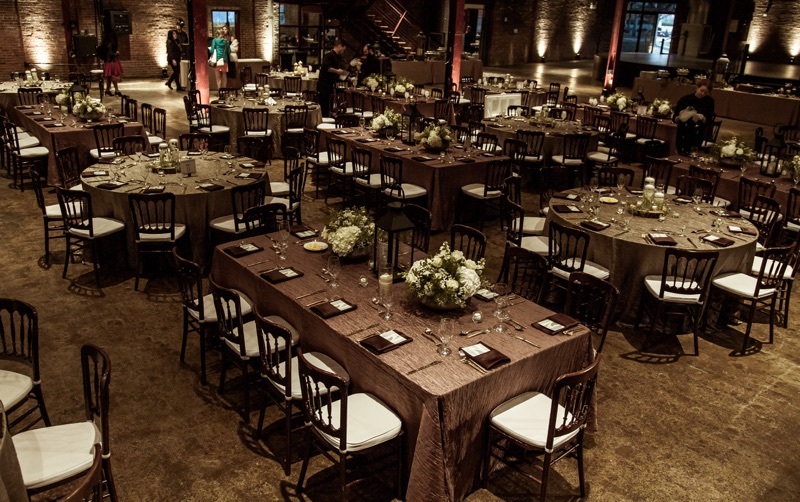 Using an array of browns, rich greens, and soft cremes, we pulled off this warm look at The Factory in Franklin. If anyone is familiar with The Factory, you’ll know that this building has an industrial, yet modern feel to begin with, so it wasn’t had to achieve our vision for our 170 guests. The Raining Season supports child adoption in Sierra Leone, Africa, and Saturday night, they were announcing their newest endeavor – The Roots Project. This initiative will help in-country children find their perfect home and family. Since this organization is inviting and accepting, we wanted the gala to encapsulate that exact same feel. So how did I get the ball rolling to plan this event? Well, this particular organization is very hands-off when it came to the design and planning the overall look of the event, so I was able to let my creative juices flow. We discussed their ideas and thoughts, and then they allowed me to take the wheel on everything from the table tops to lighting . When working with organizations that the some purpose of the event is to raise money, it is important to be mindful of the spending. The event had to be elegant and yet not over done but not under done as well. I decided to to start with what I had in inventory and build from there. I had these amazing lantern that I decided would be perfect to incorporated into the centerpieces. Typically when designing an event, I start with and element, and a few photos that depict the feel that I want my client to experience when they walk into the room. These lanterns were a focal piece for high-top tables, silent auction tables, and we used them as an accent to the center pieces on the King’s tables. They were a great starting point, then we built from there. Next, in order to achieve the desired look the foundation was wanting, we chose a little higher end linen for the tables. The Latte and Avocado crinkle taffeta linens gave the tables textures and a very elegant look we needed. Next, to go along with the earthy tones and soft colors, these gorgeous flowers and faux tree trunk center pieces were the perfect fit for these rustic, elegant center pieces. With the lighter center pieces, I knew we needed the candles and white flowers to give that shimmer and keep it charming. We kept the lights dim, but just enough to create a warm glow with overhead string lights. After the decor came one of the most important steps – the food. Simply put, good food is what will make people feel happy and grounded. When I was deciding on some menu items, I knew who I needed to work with , G Catering is absolutely amazing!. They brought an extremely flavorful menu to the table. We chose a chicken, spinach an artichoke entree with very root, farm-to-table side dishes. This American style food was not only absolutely delicious, but the perfect parallel to the night’s theme. Energy is next on the list, and music is the perfect tool in order to complete the overall feeling of an event. The music was a very modern, upbeat pop playlist created by one of the founder’s daughters (bonus!). It kept the energy light, flowing, and comfortable. Lastly, with the help of The Raining Season, we held a silent auction for guests to bid on. Items included hand-carved art pieces, paintings, hand-woven blankets from AFRICA , and much more. Guests were able to mix and mingle before dinner in order to donate and encourage the growth of the foundation. Overall, the night was beautiful and when it comes down to it, we were all able to come together to support an amazing organization. The Raining Season and similar philanthropic foundations are some of my favorite events to help organize and produce. Keep and eye out for our 3rd annual Gala in the fall of 2018! If you would like to donate to this amazing organization please check out their website at: http://www.therainingseason.org. If you have an event coming up that you would like us to handle the planning and design, call us at TODAY at 615-830-0549. We would love to hear your story and help you to create the perfect event! Want to know more about this event? Comment with any questions or follow me on Instagram @lauriedeanneevents. Be sure to check out other posts on my page, such as my Make-A-Wish collaborative event.